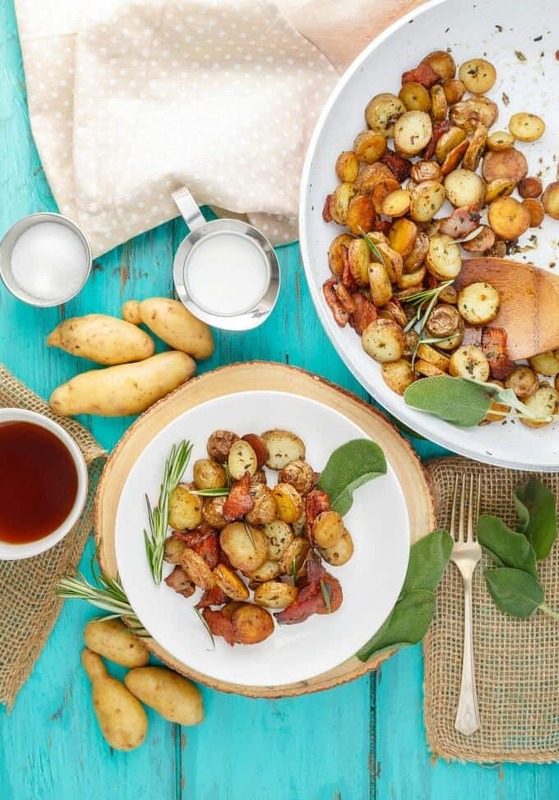 Breakfast is definitely not my favourite meal to cook, but there is something about these pan-fried fingerling potatoes with bacon that have me coming back to this recipe time and time again! This is a sponsored post. I was fortunate enough to receive products and monetary compensation from The Little Potato Company. Though products were received, all opinions are my own and I would not recommend a product that I did not enjoy. 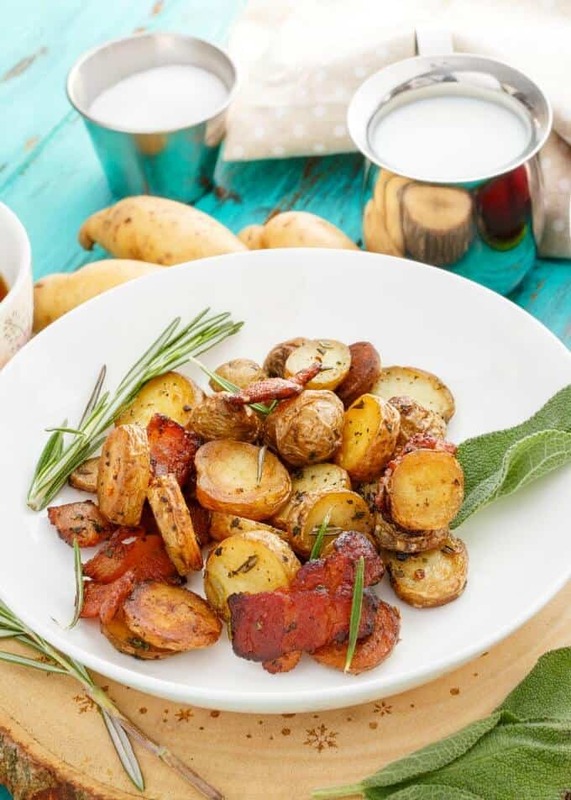 The recipe and photos for these pan-fried fingerling potatoes with bacon have been updated as of March 26th, 2017! Do I have something amazing to share with you today! I was lucky enough to receive four bags of creamer potatoes from The Little Potato Company. I was completely surprised (and extremely happy) when the package showed up. But probably not as excited as my husband. He is the potato king. I mean it. He can be super full from a meal, and still have room for potatoes. And his favourite potatoes? 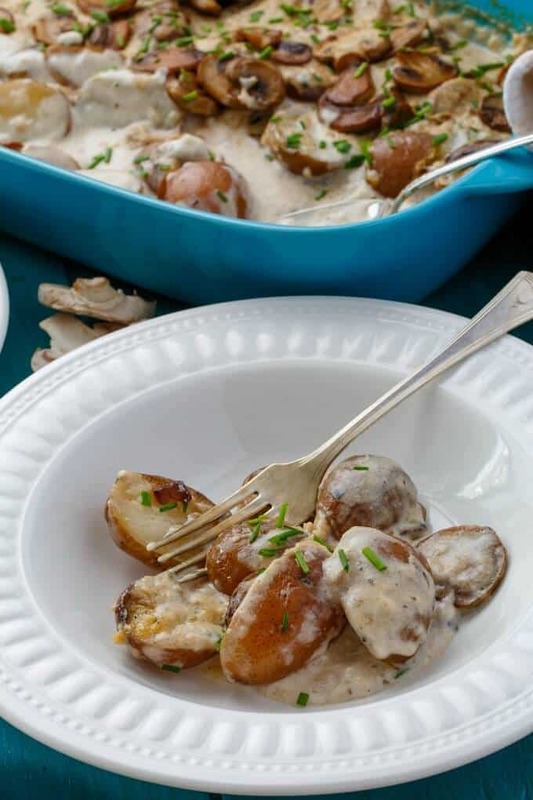 The amazing creamer potatoes! So it can be safe to say he was extremely happy with the baby boomers and fingerling potatoes we received. While I thought I would originally go for the baby boomers first, I was entranced by the fingerling potatoes. I had only seen these potatoes on the Food Network and was anxious to give them a go. I have to say, they were super easy to work with and according to my taste-testers, super delicious! Actually, my little taste-tester loved these pan-fried fingerling potatoes with bacon so much, she kept sneaking back upstairs to refill her bowl while I was working on cake decorating! I had to actually hide the potatoes so Dan could try them! 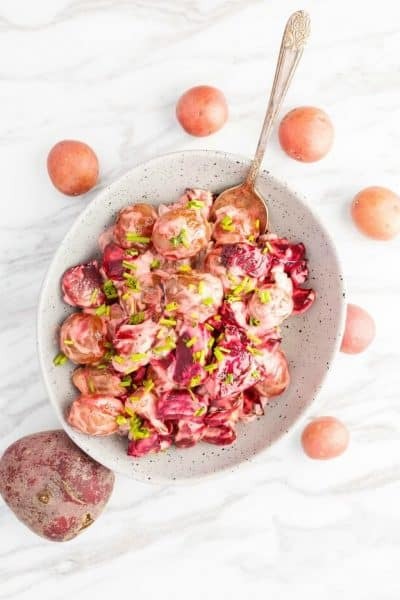 She isn’t even a potato fan and she could not stop eating this recipe! 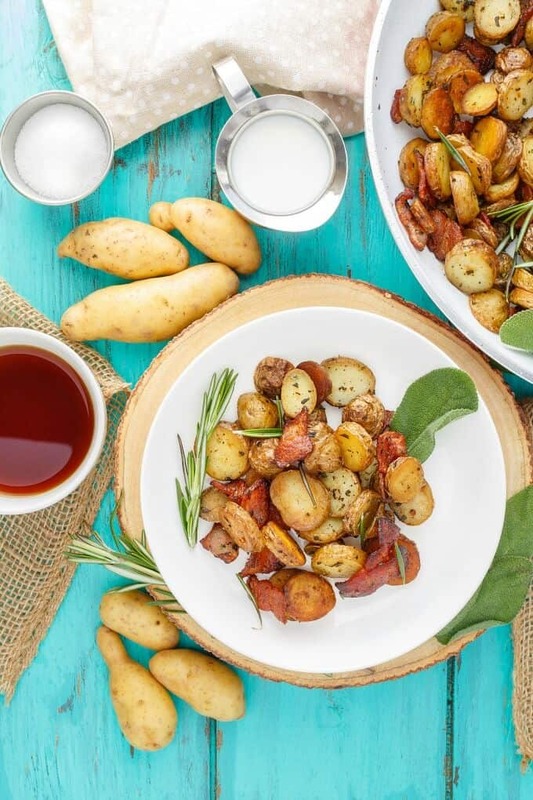 Now, I did make these pan-fried fingerling potatoes with bacon, so it was a no go for me. However, I knew I wanted a vegetarian version of this dish so I went kind of crazy and made a caramelized onion version using oil instead of bacon (and the bacon drippings.) I guess, now that I think of it, they are actually vegan! 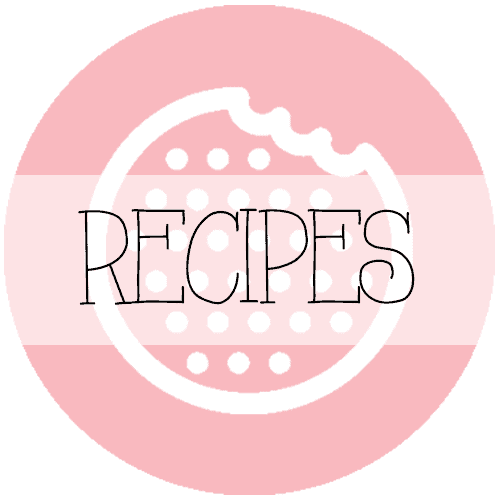 I love showcasing one recipe, and then customizing it to suit other dietary needs! Of course, fresh sage and rosemary were added to each to give the dishes a sophisticated taste. Not a fan of sage and rosemary? Sub in your favourite herb or omit altogether! Strange for a vegetarian to be making pan-fried fingerling potatoes with bacon to begin with, but there is a story to this recipe. When I was younger, my dad would make my brother, sister, and I home-style potatoes for breakfast, and he would use up leftover bacon grease to fry them in. While not healthy at all, we loved them! After spending so much time making them, he would always let us have our bowls first, sometimes only leaving him with the tiniest amount of potatoes. But we loved them so much we could not help it! As we grew, we went from being the potato stirrers (with dad reminding us constantly to toss the potatoes with a spatula and not crush them!) to full on making the recipe ourselves. It is a family favourite, and I knew I wanted to share that tradition with my readers. Rest assure though, my dad was not using fresh herbs in his recipes! 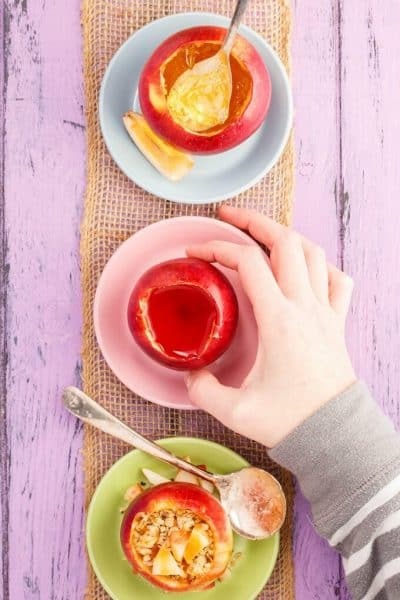 A fun breakfast that is made quickly if you pre-boil your potatoes the night before! 1 1/2 lbs fingerling potatoes, sliced into 1/4-1/2 inch rounds. Add potatoes to a large pot of salted water. Bring to a boil and cook for 4-6 minutes, or until fork tender (do not overcook!) Drain and rinse under cool water to stop the cooking process. Add the potatoes and season with salt and pepper. Cook for 15-20 minutes, stirring occasionally. You want a nice golden brown colour to them. Stir in garlic, rosemary, garlic, and sage. I left the sage whole for added flavour, and it can be easily picked out. Cook for a couple of minutes or until garlic is nice and aromatic. Stir in bacon. Season again. Serve with fresh herb garnish if desired. If bacon grease soaks up, you can add butter or oil to help the potatoes. 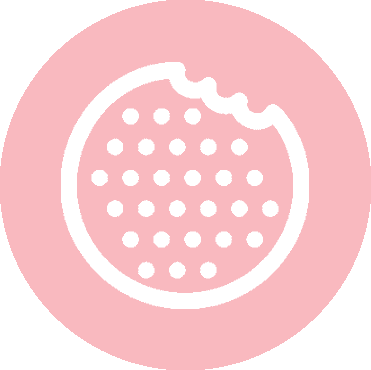 I am so happy to have worked with The Little Potato Company! Each bag is 1.5 pounds of per fresh, high-quality potatoes. I love the variety they offer, too. Everything from red potatoes to blue potatoes! How awesome is that?! The small bags are the perfect amount for side dishes to a gourmet meal, or even a small meal for the potato enthusiast (aka, my husband.) 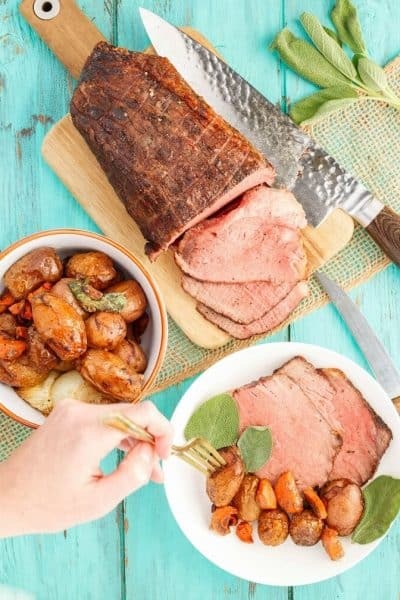 I already have another recipe idea in mind for the baby boomers, but for now, my taste-testers are digging this recipe and I want to keep them happy! I love fingerlings - they're so irresistible! And potatos + bacon is always a win. These sound delicious. I am all about potatoes, I think I almost love potatoes more than I love chocolate! Definitely saving this recipe to make for a fancy dinner! You definitely sound like my husband; he could eat potatoes with every meal! 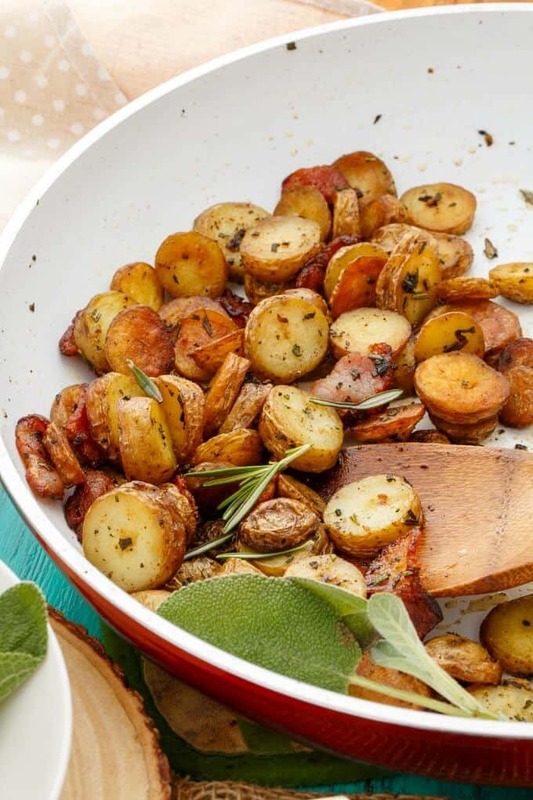 Ohhhh crispy potatoes and bacon are a match made in heaven! This looks heavenly! And I love that your little one kept stealing them.. thats too cute! WOW!!! What a gorgeous post! 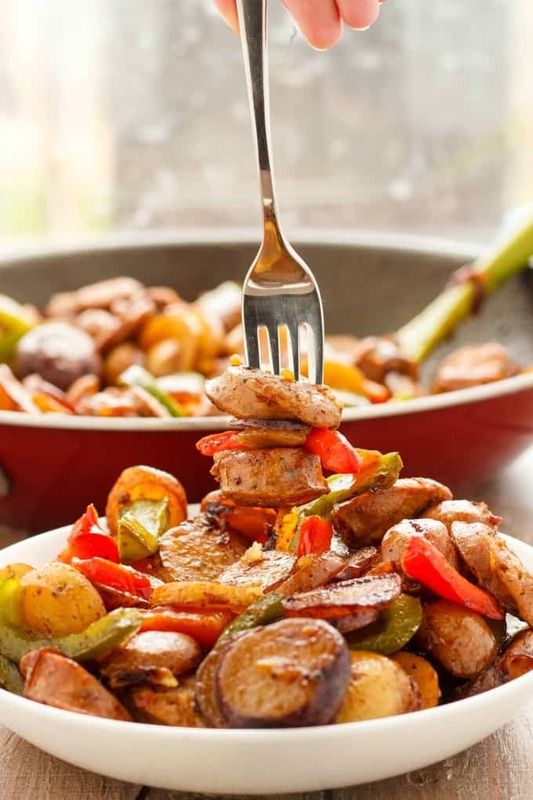 Those little potatoes are adorable, and it looks like you cooked them perfectly! The bacon is such a nice addition. I'l have to put this on our dinner table soon! Oooh what a fun partnership - their potatoes look great! I love what you made with them - this dish sounds so delicious!! Can't go wrong with bacon and potatoes! I would like to see your carmelized onion recipe please! My husband loves them, and I'm in need of direction🤔! Thank-you! Just made this tonight and it was delicious! I used mozzarella, artichoke sausage and the family loved it. Husband asked what kind of potatoes, I had never cooked fingerings before. 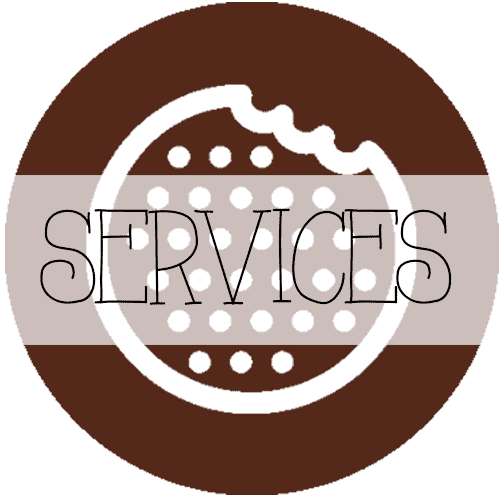 Definitely putting this on regular rotation of the menu plan. Thanks!